We come from all over the country…and the world. We're single and married, working and retired, and from every background you can imagine. We're active and social, and united in our desire to make new friends and to enjoy life. The Cape Coral New Resident Club was formed to help you make new friends as you learn about your new home town with its multitude of social and outdoor activities. The club was established in 1967 and has over 800 current members. 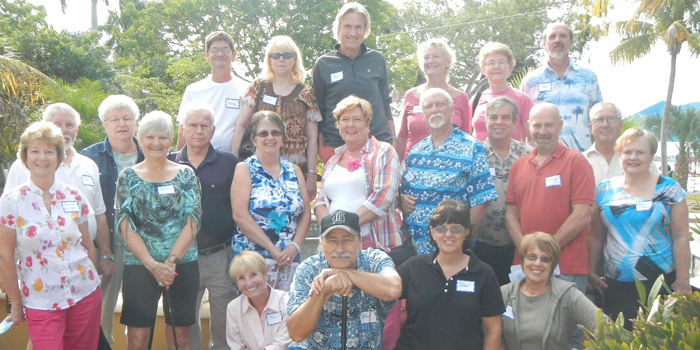 You will be part of a Cape Coral tradition with many varied events each month to join in and make new friends. We are a non-profit organization with over a 50 year history of welcoming new residents. Our goal is to introduce newcomers to our great tropical lifestyle and help new members become familiar with the interesting activities available in our area. The club provides a network for new residents to become active in their new community, enjoy planned activities and make lasting friendships. We hold a general membership meeting at 9:15 a.m. on the first Tuesday of each month at the Yacht Club (5819 Driftwood Parkway). Please join us for coffee and a light snack and get acquainted with the most dynamic social group in the Cape. In their wildest dreams, the Rosen Brothers could not have known the success their development of “Red Fish Point”, later to be called Cape Coral, would be. The Cape Coral of the 1960’s and the Cape Coral of today may appear to be different, but the lifestyle sold by Jack and Leonard hasn’t changed much at all. They envisioned a place where waterfront living, along with access to the Gulf of Mexico, could compete with the multi million-dollar properties that sit on the beach. In 1967 they advertised lots for $20 per month with a small deposit to entice people to buy. People bought, some built homes and moved to Florida right away while others waited until retirement. The folks that moved right away found a rugged and remote village with very little to do. There were no bridges to Ft. Myers, very few stores and fewer families. Paul Sanborn, the head of marketing for Gulf American, was pushed by the brothers to find ways to entertain the residents of their growing development. The local hotel agreed to allow local kids access to their pool once or twice a week and Paul started holding pot luck dinners at the Yacht Club. People began to look forward to these events and as the neighborhoods, along with their friendships, began to grow, Paul was busy with more important work. Well, take over she did, and you are enjoying the club today due to her efforts. The pot luck today is the same as the pot luck in 1967 but we now hold them at our homes, in our parks, and at restaurants. The Constitution she helped create is still at the core of all we do. In her book about the history of Cape Coral, Lies that Came True, Eileen Bernard says, “The brothers and their retinue made life in Cape Coral a ‘heady’ brew and anything apathetic was run out of town.” We like to think that those joining the club help to continue the tradition the Rosen Brothers set forth. Please carry on, have some laughs, and apathy be damned.